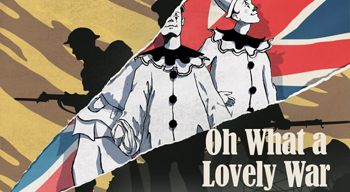 Coming on the centenary of the Battle of Passchendaele, one of the most well-known of the many infamous (and seemingly pointless) episodes of the First World War, this new production of Oh What a Lovely War serves as a vibrant and graphic reminder of one of the darkest chapters in the history whilst providing a showcase of music, spectacle and comedy. Over the course of two hours, the show attempts to give a broad perspective of people and events across the Western front from a British perspective, covering the whole period of 1914-18 without presenting the outcome as a victory for anyone. Oh What a Lovely War was revolutionary when first performed in 1963, tackling a dark and difficult subject with humour and razzamatazz whilst ensuring that all the source material was accurate. This concept has been taken further in the Oldham Coliseum Production with a superb presentation as an actor/musician show, usual multi-media and whilst understandably very stylized (with all of the cast wearing Pierrot costumes). The attention to detail is remarkable, with hats used to represent the various characters, be that a French general, German infantryman or English aristocrat being extremely accurate and all staging, music and dancing being in keeping with the music-hall traditions of the period. This is no Jesus Christ Superstar, re-telling a familiar story with modern music and a new twist but history told from society’s perspective with music and styles which people of that time would recognise. Even the back-drops of newspaper headlines (again, all authentic from the time) are presented in the style of stills from contemporary silent films. The pace of the show is non-stop and it is nothing short of impressive to watch the all-round excellent cast move seamlessly from scene to scene, variously swapping a wide range of musical instruments for props and the hats which provide the key to identifying each character, both individual and representational. There are elements of standards from knockabout comedy and music hall routines weaved into the various scenes but nothing ever takes us very far from the times or the events in question and the overall effect is to provide a very rounded representation of the war from a host of viewpoints, be that the sweetheart waiting at home, the detached top brass safely away from the real action or the long suffering Tommy or Jerry fighting it out at the front. For me, the interplay between the British and German soldiers was particularly effective, stressing above all else the common humanity existing between the combatants above all the carnage, hatreds and slaughter. After acknowledging that this production in particular of Oh What a Lovely War gives both an entertaining and poignant reminder of what terrible and unnecessary suffering was brought about through the First World War, a word of warning must be given. This is a political work and as such has its own hidden biases as much as any other work of the period. Joan Littlewood was a committed communist (so much so she was prohibited from working for the BBC during the Second World War). As such, Oh What a Lovely War whilst being historically accurate in the information presented is none the less very selective in how and what material is transmitted. There was a lot more to the First World War than simply the proletariat being used an cannon fodder by a stupid and corrupt aristocracy and a considerable amount of revisionist work by historians has gone some way to dispelling to the myth this was the ‘bad war’ (ie. without any purpose or meaningful result). In contrast, the Second World War was fought for sound, identifiable principles. As Max Hastings has pointed out, Germany’s war aims in 1914 in real terms differed little from those in 1939 and it is a dishonour to the British and French soldiers especially to suggest they all died for nothing. 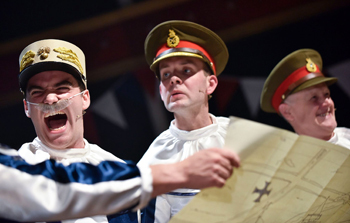 A truly entertaining and great night out, Oh What a Lovely War is on at Oldham until 30th September and well worth catching, both as solid entertainment and food for thought.